I figured I’d be a gigantic hypocrite if I created QuiltAlong.net and then didn’t participate in a program or two. After writing all the descriptions (36 listings so far) I decided that the Gen-X Quilter Moccasin Block of the month really called to me. I signed up then sat on the floor before my stash and got to thinking. It would be nice to use primarily stash items for this quilt but with it being a a BOM it’s a risk that by the end I might run out if I don’t follow the fabric requirements and yardage. Then I spotted a layer cake I’d forgotten about, Chantilly! I’d picked it up along with yardage of two coordinating solids and some prints. I didn’t leave myself a map to what pattern I’d had in mind when I picked up this fabric so I figured why not do it? I pulled those out and supplemented with some solids from my local little quilt shop and am excited to get started on block 1! I’m certain I have enough for the front, backing and a matching pillow! I’m probably nuts doing this BOM with these fabrics but I wanted to use stash items if possible. The only solids I really have in the stash were the blue and the green so why not go for it? I think I’ll know within the first block if that was a mis-calculation! 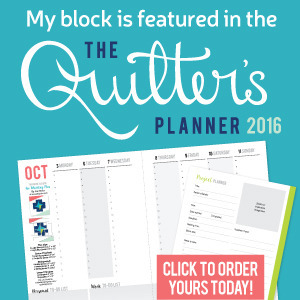 Are you doing any of the 2015 block of the months? PS. Don’t forget there’s a giveaway going on till January 9th, 2015! I think that pulling from your stash is a really fun idea, and I look forward to seeing how these fabrics play out in the Moccasin BOM. I really wish I was doing this BOM! And what a fun fabric pull. Good luck! Oh, what pretty choices! I love fabric auditions. :o) Can’t wait to see your first block. Oh they’re beautiful fabrics – that’s going to make a stunning BOM! Your fabrics are fabulous and I think they will make a softer, more sunny version of the Mocassin quilt.